A clean, well-lit showroom and warehouse totaling over 8500 square feet await you at Service. We carry  on hand  everything you need to stock your bar or host that perfect get-together. Our more than 5000 items include a selection of imported beer, single malt scotch, premium tequila, schnapps and cognac that's unmatched in Hot Springs, Garland County, and most of Arkansas. In terms of selection though, it's our wine department that sets us far above the rest. We make special arrangements with importers and distributors to make both rare and economical wines available to our customers. On our shelves you find everything from Auslese to Zinfandel  at prices to fit any budget. If you're wanting to try something different, stock or start a wine cellar, or just need advice on what wine to serve tonight, Service Liquor & Wines is the place to go for help. 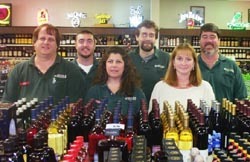 We've been a part of Hot Springs since 1979, and our friendly and knowlegeable staff has more than 80 years combined experience in the liquor industry. Whether you're buying a single bottle of bourbon or supplies for a party of 200, you can count on the folks at Service. We'll greet you with a smile, help you in any way we can, carry your purchase to your car, and save you money with our volume buying power. Here on our web site you'll find some of our best buys, useful guides and charts, photos, and even our weekly advertised specials. Read what Market Watch magazine had to say about us, and be sure to come back often. Here, or in person, you'll always find something new at Service Liquor & Wines.